Do you have a Survivorman TV show fan in your house? Or maybe you are looking for the perfect gift for the outdoors-man in your life? Then you have got to check out the awesome Survivorman products available for sale! Les Stroud, star of Discovery Channels Survivorman has an array of products any outdoors-man would love. 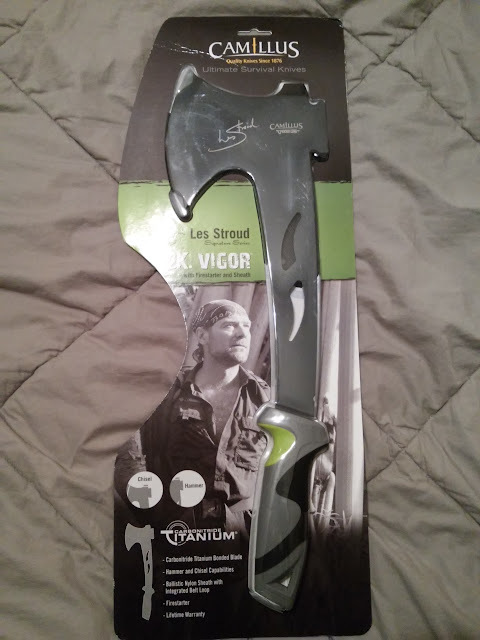 My husband absolutely LOVES the tv show, Survivorman, and now can be one with his new Camillus Les Stroud S.K. Vigor Hatchet! It is the perfect tool to use this summer while camping, hunting, fishing or even around the house and yard and my husband LOVES it! It features an awesome Carbonitride Titanium Bonded Blade and it also can be used as a Hammer and Chisel! It includes a Ballistic Nylon Sheath with Belt Loop and Firestarter! The Blade Length is 5.25" and is small enough to fit in your vehicle or in the garage but big enough to accomplish tough jobs! This really makes a great gift for the outdoor loving person in your life this summer! You can purchase the Camillus Les Stroud S.K. Vigor Hatchet for $54.99 from the Survivorman website.